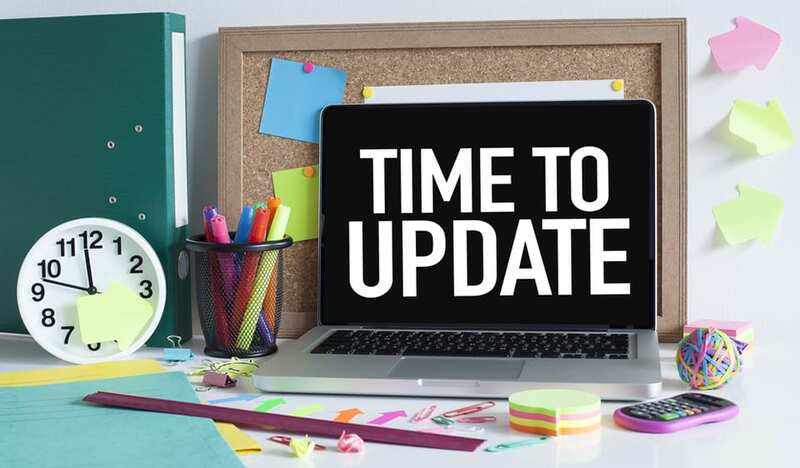 10 Telling Signs It’s Time for a New Website will work well on any device and will increase the chances of visitors staying longer and engaging more. 4. You can’t make simple updates without a programmer. Being able to easily modify site content on the fly is essential. Many Content Management Systems (CMS) available today empower non-technical users to easily update site content on an as-needed basis. If you are still relying on programmers to make the simple changes, like adding photos or updating text via code, it’s time to consider a website built on a moden CMS. 5. Your website lacks critical functionality. Web technology that was cool and cutting-edge a few years ago may be out-of-date today (Flash, anyone?). With a site redesign you can take advantage of the latest technology that web-savvy users expect. If you’re looking to add e-commerce, secure member login portals, robust marketing content, or would like to integrate your site with other applications and tools, a modern CMS will give you much more flexibility to achieve this. Adding a bolt-on tool to an outdated website is often less effective and costs more than creating a new one with the functionality built in. 6. Your site is not secure. Does your site begin with https? Do you have a security certificate? If not, your site could be an easy mark for cybercrime and other vulnerabilities. Additionally, if your site accepts credit card details, processes payments or even holds onto customer data, security is of utmost importance. PCI compliance is just one of the regulations you must adhere to unless you want to inherit crippling fines or risk getting your site shut down. 7. Your site is slow. If you’ve ever waited for a site to load, you know how frustrating it can be. The reason it’s happening is because it’s bogged down with image files that are too big, code that is out of date, and/or elements that just aren’t needed anymore. This could be due to a number of things such as overcomplicated code, outdated CMS, too many file requests, and much more. If this is a recurring issue, it’s worth getting your site evaluated. 8. Your visitors are not converting. This could be due to deep-rooted business or branding issues such as insufficient product/service value or not knowing your customers. Or, it could a design flaw causing a bad user experience, or the simple fact that you don’t have strong enough call-to-actions. This should be a big red flag that some changes need to be made. 9. You like your competitor’s website better than your own. In today’s marketplace, having a great looking site is not a luxury, but a necessity. And in most markets, you need every edge to stay a step ahead. Check out your competitors’ websites and see how yours compares. Take note of what they are doing better than you and fill in any gaps. If the gaps are too large and you’re lacking in more than one area including user interface, speed, performance, and content, it might be time for a redesign to get that competitive edge back. 10. Your site lacks strategic design. A professionally designed website is oftentimes a big commitment in terms of time and capital, so working with a team that you know and trust is very important. While no site can last forever, it’s important to work with experienced web designers and developers that know how to make the most of your investment and how to future-proof your solution. This involves careful planning, a thorough understanding of your business needs and goals, and knowledge of how your business model could change over time and what changes to make to your site to help you get to where you’re looking to go. IT Solutions' experienced designers and developers work together using the best industry tools to create websites that are as helpful to your business as they are pleasing to the eye. We develop sites that capture your brand and messaging while also accommodating challenging business needs with built-in, custom back-office functionality or integration with key line-of-business systems. If you’re considering redesigning your website, looking to integrate your site with critical business applications, or would simply like an evaluation of your existing website to ensure you’re not missing new business opportunities, contact IT Solutions today. The modern consumer is digitally driven, socially connected and mobile empowered. Today, 74% of buyers conduct more than half of their research online before making a purchase or having their first interaction with a sales associate. As such, clients are demanding faster service and simplified interactions.The tools you invest in should reflect these evolving trends. Your website is your main focus of your online marketing strategy. If your site is not up to par you could risk being left behind and losing new business opportunities. 1. Your website looks and feels outdated. Your website is the first impression for prospective customers, and your primary online marketing tool. If your company website is stale, your visitors will assume your company is too. Good companies evolve and grow over the years and your website is the best way to showcase who you are. Having an updated website sends a message that your company is thriving, forward-thinking, and ready to take on new customers. A modern, aesthetically pleasing site can help increase your conversion rate almost instantly. 2. Your website is difficult to navigate. User experience is extremely important in today’s online world where information is readily available. A site has about four seconds to make an impression before visitors hit the back button or close the browser. Your navigation must be well-organized and your content must be easy to understand with clear calls to action. If visitors can’t find the information they need, they will go elsewhere to find it. 3. Your website is not responsive or mobile friendly. Over one billion people rely on their mobile devices for their online activity today. A Google study suggests that 90% of multiple device owners switch between screens to complete tasks, using an average of three different combinations every day. Having a consistent web experience is extremely important for building trust. A responsive web design will work well on any device and will increase the chances of visitors staying longer and engaging more.